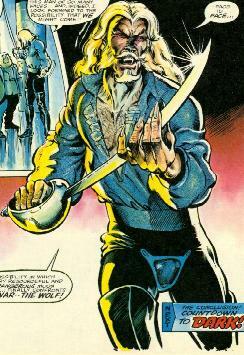 Powers/Abilities: Lupinar suffered from hypertrichosis, which had given him an animal-like appearance with rapid hair growth, long fingernails, and a wolf-like snout. He was an accomplished strategist, and expert swordsman. History: (Hulk! Magazine#13)- Lupinar, planning an unheard-of terrorism scheme, became aware of the Moon Knight, and that he might possibly be able to stop him. Using information from Moon Knight's enemy Conquer-Lord, he studied him, and had his servant Smelt look into his background. They began 24-hour surveillance of Moon Knight, and learnt all of his secrets, including his multiple identities as Jake Lockley and Steven Grant. Lupinar was interested in the reports obtained about Moon Knight's battle with the Werewolf, as he felt that if they should meet, Moon Knight's reaction would be interesting. Lupinar directed the terrorist factions which he endorsed to steal a statuette of Horus, which was exchanged for money, and the money then used to purchase plutonium so that they could construct a nuclear bomb to destroy New York City. (Hulk! Magazine#14)- Lupinar had the terrorists threaten to detonate the bomb unless a billion dollar ransom was paid, but his ultimate goal was to accept the money, then set off the bomb anyway, and burn the ransom. As he had feared, Moon Knight became involved, having infiltrated the terrorists, and he had his ally Frenchie bring a bomb squad to the bomb's location. Moon Knight confronted Lupinar himself at his castle-like manor. Lupinar revealed his ultimate goal to Moon Knight, then challenged him in battle with swords, knowing that while Moon Knight was a master of many weapons, he was a master of the sword in particular. Lupinar doubted that Moon Knight would kill him, and had already prepared his terrorist allies to add his release to their ransom demands should he be captured. But when Lupinar learnt that the terrorists had already been routed, it turned into a battle to the death. Moon Knight managed to disarm Lupinar, but Lupinar threw himself upon Moon Knight's blade, unwilling to be taken captive. Comments: Created by Doug Moench, Bill Sienkiewicz and Josef Rubenstein. Hypertrichiosis is a real condition, but it ONLY refers to excessive hair growth. Lupinar obviously had something else going on!